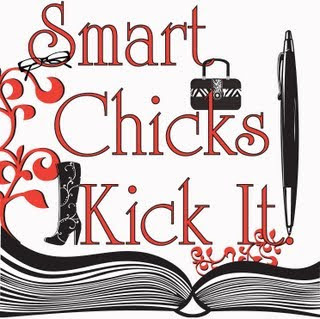 Google+ Reading Teen: Smart Chicks Kick It Tour is coming soon!! Smart Chicks Kick It Tour is coming soon!! Starting September 13th a fantastic group of YA authors will be going on tour together, stopping at various bookstores across the country, meeting their fans, and introducing you to authors you may not have read before. Some of the authors that will be on the tour include Melissa Marr (the brains behind the idea), Cassandra Clare, Kami Garcia and Margaret Stohl, Jennifer Lynn Barnes, Alyson Noel, Kelly Armstrong, Jeri Smith-Ready, and Holly Black. The brainchild of Melissa Marr, the tour grew out of separate conversations she had with Holly Black at a joint book signing at BEA in 2009; with Jennifer Lynn Barnes as they strolled to the Metropolitan Museum of Art, immediately following that same BEA; and with Kelley Armstrong, who had met Marr during a ComicCon signing in 2009, arranged by their mutual publisher HarperCollins. They all enjoyed group tours more than solo tours and liked the idea of planning their own schedule and pooling their relationships with bookstores. As Marr put it, "What we do, we do at home alone. A lot of us have shy streaks. I do better talking about their books than I do talking about mine." One of the things that the more popular authors are looking forward to is introducing their loyal fans to new authors whose books they've read and loved. "That was part of Melissa's initial pitch, which was very good--she could totally have another career in marketing," said Clare. "She wanted to have established authors and some who were just starting. The more kids are reading, the better it is for all of us. Keeping them looking forward to new books the way they do new movies is good for us." Marr, looking around the group (which gathered at ALA earlier this summer), said, "You're doing more of a ghost thing [referring to Smith-Ready], I've got fairies, you've [Barnes] got werewolves, Holly's got curseworkers. We're each others' read-alikes. If we're going to pimp books, we're going to pimp books we like. We're helping our readers wade through the chaos." The author will be providing a PDF of the Smart Chicks poster so that people who can't afford to buy all of the books can still print out the poster and have all the authors sign it. There will also be a raffle that attendees can enter to have their name be one of the characters in an anthology that the authors are putting together. Your name in print!! Forever!! At each stop, there will be raffles to win various books from the authors as well! Something that I found really interesting is the amount of fans that are adults! YEAH ADULTS!! I guess we're finally catching on that YA isn't just a bunch of mindless fluff! Many of the YA authors also attract adult crossover fans. Clare estimates that roughly 40% of her fans are over 25; and Marr said that about 70% of the people who showed up for her Wicked Lovely series tour were adults. Smith-Ready and Armstrong both started as adult fiction writers, and in Armstrong's case, her Darkest Powers books are also set in the same world. Both Armstrong and Smith-Ready note a difference between the two readerships. "Teens as an audience are very involved," Armstrong said. "It becomes a social thing where they can discuss books, make online sites, create videos and trailers. They're quick to tell you when they like something and very quick to tell you when they don't." Smith-Ready also noticed a difference between her teen and adult readers. "[Teens] think for a living. They're taught to analyze books," she said. "Adults in general are reading for escape; they're not less critical, but they're less analytical." Armstrong also likes seeing mother and daughter, or aunt and niece at a signing, and discovering they're both reading the series. "As a mother of a teenager I know how important that is," said Armstrong, "and how hard it is to talk to your teen." I completely agree! I think that one of the best ways for parents to connect to their teenagers is to share an interest with them. Reading the same books is a great way to accomplish this! SO! Parents, grab your teen and head out to the Smart Chicks Kick It Tour!! They'll love you for it! Hey, Jackson, Mississippi. I think that's only 2-ish hours from me. Thanks for the heads up. Kami + Margaret = WOW!